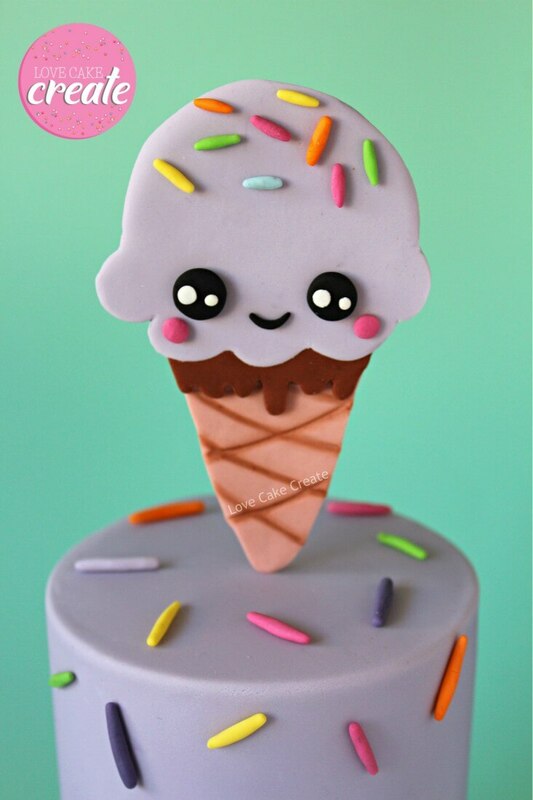 Add a sprinkle of fun and sweetness to your cake with this ice cream cone cake topper tutorial. 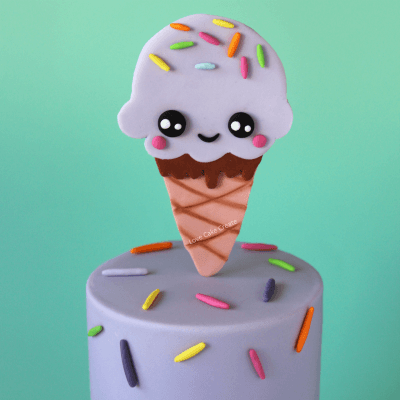 Whether you’re creating a cake for a summer party or wanting an easy and playful cake for a little one, this ice cream cake topper is sure to delight! 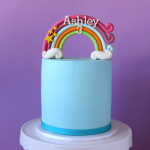 Vibrant, sweet and above all, easy was my aim with this cake topper. You know sometimes you want to throw together a simple cake, but one that still packs a visual punch? Well this is one of those cakes. 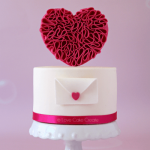 You might have an inkling by now that I love cake toppers that stand up on cakes – check out my ruffle heart cake topper here or my bright and colourful rainbow cake topper here. 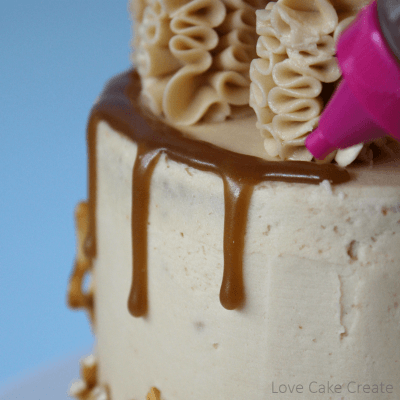 They’re so much easier than they look and really help take your cake to the next level. 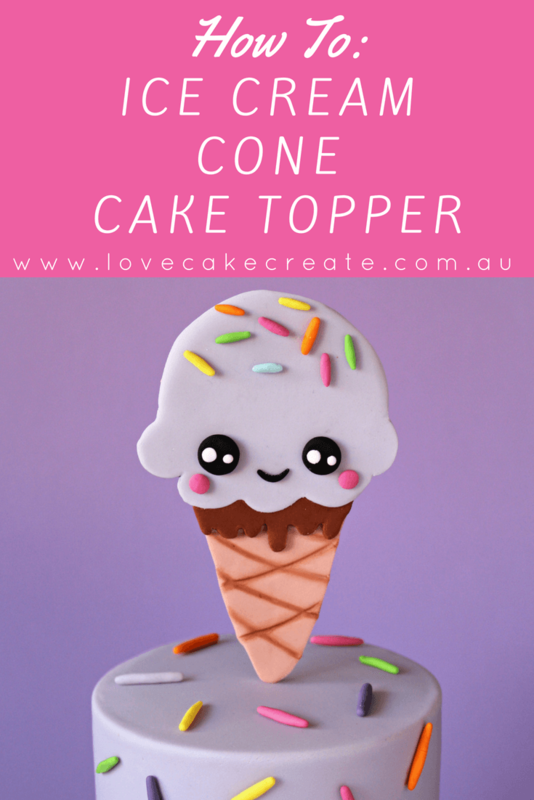 Ice cream and sprinkles are a favourite among kids and I thought an ice cream cone topper would be fun to create. 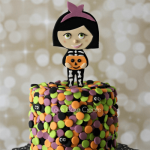 With her sweet little face and added sprinkles, this cake topper would be a hit at any party. I’ve added a template here for the ice cream cone that I created, or you can use Google images to find your own ice cream cone template. There are so many different options! This topper measures approximately 11cm high from top to bottom but you can re-size it if you need to. Originally when I started making the ice cream scoop part of the topper, I used the Americolor Electric Purple gel but it was the wrong shade of purple (I wanted something much more pale). I ended up taking it off half way through and changing it to the Wilton Violet gel instead. So the first few photos have the Electric Purple, then I switched it to the Violet. You can of course use any colour you wish, it doesn’t have to be purple. The sprinkles are made out of fondant, so you only need a tiny amount of fondant for those bits. Real sprinkles would work too, it’s totally up to you! This is how I like to make my silhouette; feel free to use your preferred method if you like. Trace the ice cream cone shape on to a piece of baking paper. 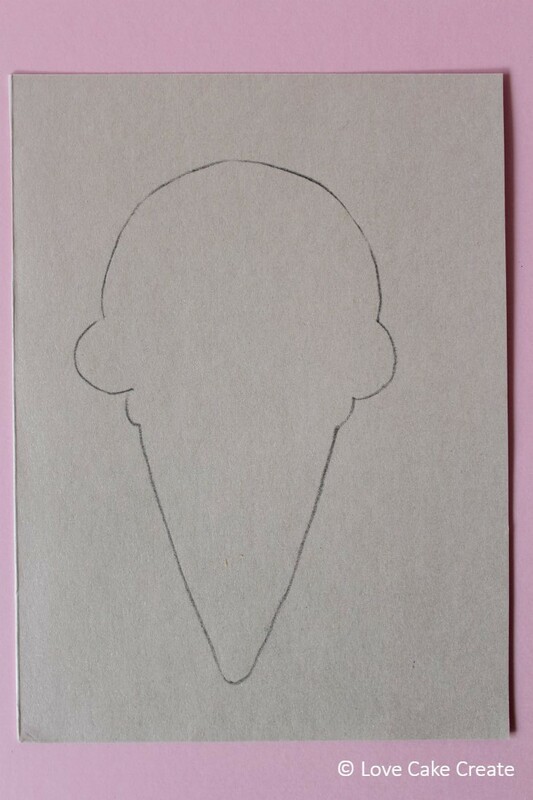 Flip the baking paper over and re-trace the ice cream cone shape on the back. Flip it back over to the front and lay the ice cream cone over a piece of cardboard. Trace over the ice cream cone one last time. You’ll see the pencil that you use on the back of the baking paper has now transferred on to the cardboard, leaving you with the desired silhouette. Cut out the ice cream cone and pop the template aside. 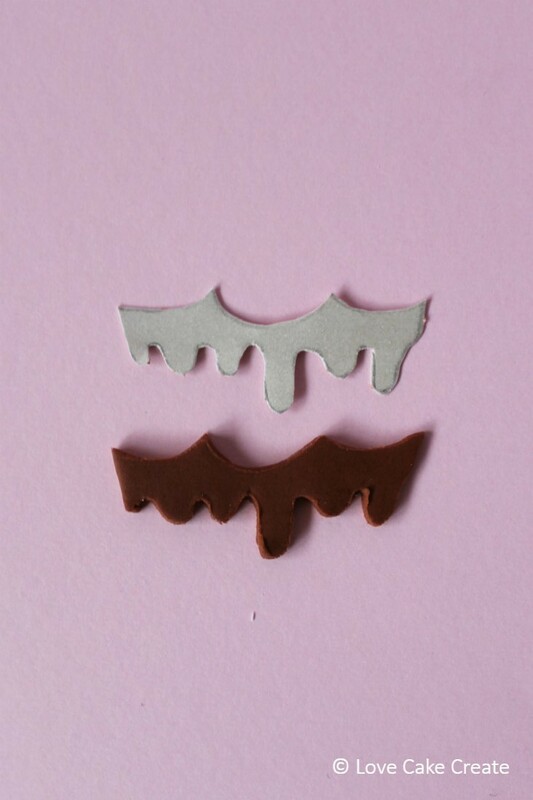 Using the same method above, create templates for the ice cream scoop and the chocolate drip. Take the light brown fondant and push it into the tylose. Mix in the powder that sticks to the fondant. Repeat that once more – adding the tylose will ensure the topper dries quickly and firmly. 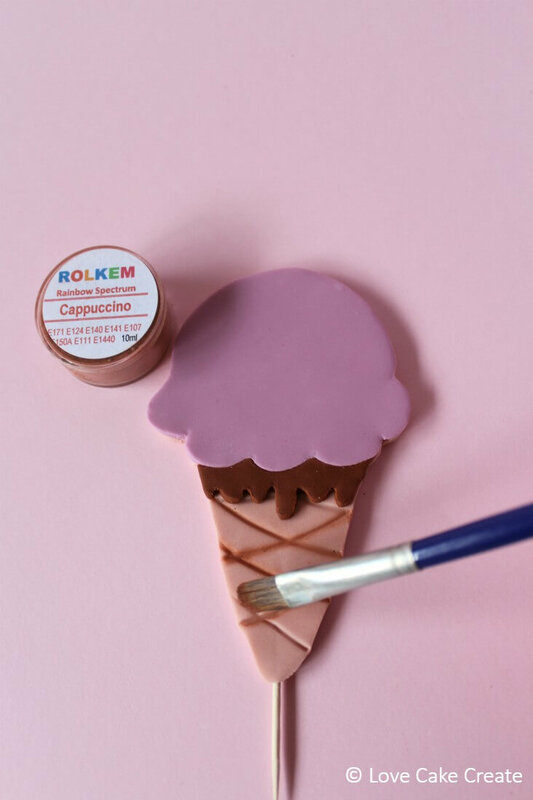 Roll out the light brown fondant to approximately 5mm thickness – it needs to be thicker than your toothpick/cocktail stick or bamboo skewer. Place the ice cream template on top. Cut out the shape using the exacto knife/scalpel. Use your fingers to gently rub over the edges to remove any stray bits and soften the edges. Take the toothpick, dab it in the sugar glue and insert it in the bottom of the ice cream cone. 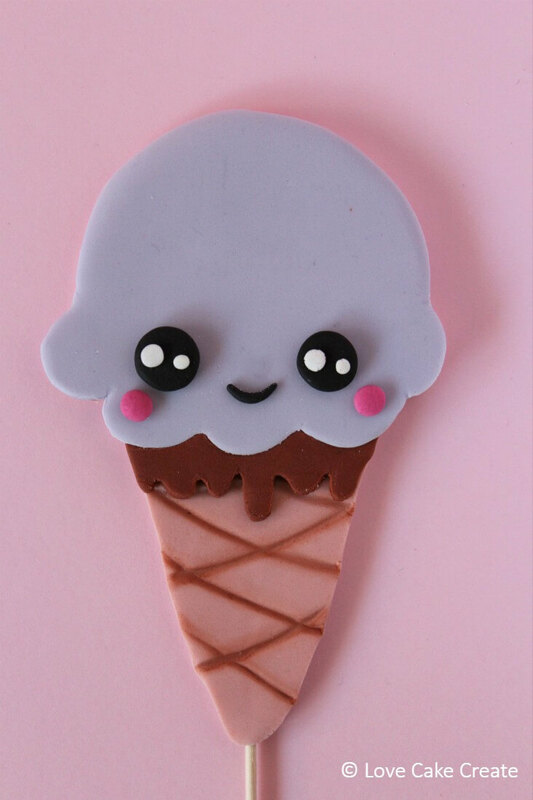 I’m right handed and found it easier to position my left thumb on the front of the ice cream cone and my left index finger at the back of the cone – then you can feel the toothpick being inserted with your right hand and guide it through so it doesn’t pierce the fondant. Lay the silhouette down flat and use your finger to rub over the front and smooth out any bumpy, uneven bits. We need to create the pattern on the cone before it begins to dry. 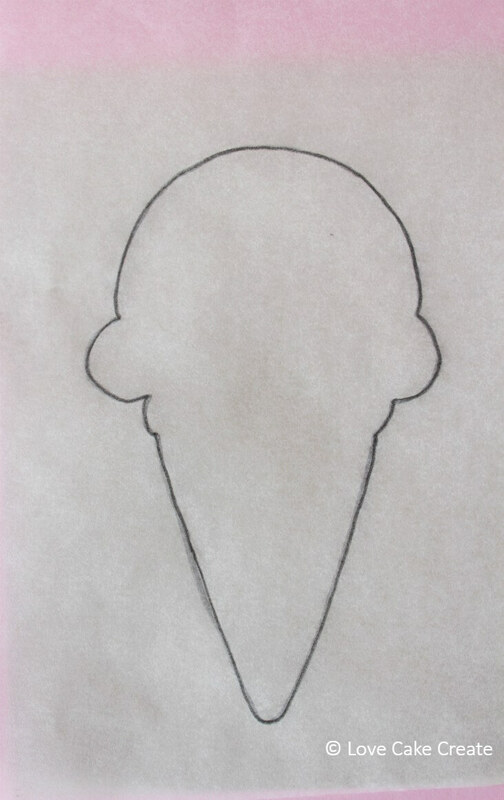 Take the ice cream scoop silhouette and lay it gently on top of the ice cream (as shown below). This gives us an indication of where the scoop will sit and where we need to create the pattern on the cone. Use the Dresden tool to score lines across the ice cream cone in a diamond pattern – mine aren’t in a perfect diamond pattern, so I’m sure yours will look better! Pop the ice cream aside for a second while we work on the rest. Push the purple fondant into the tylose and mix in the powder that sticks to it. 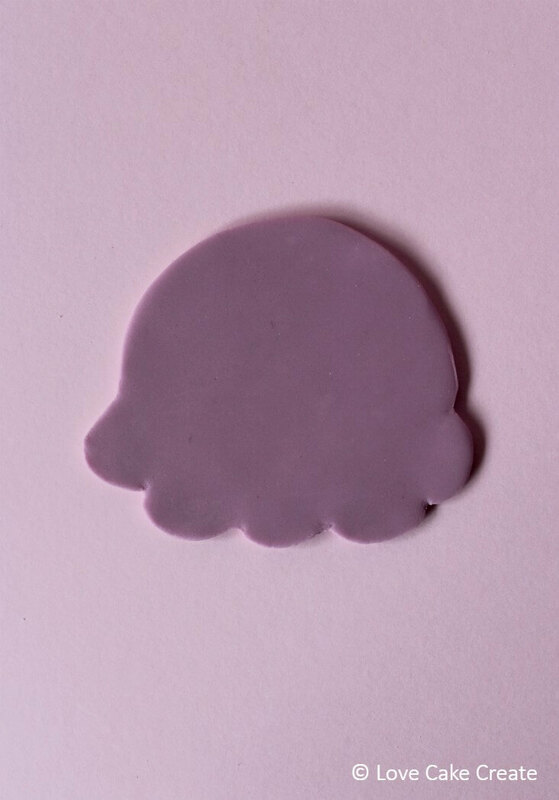 Roll out the purple fondant to approximately 2mm thickness. 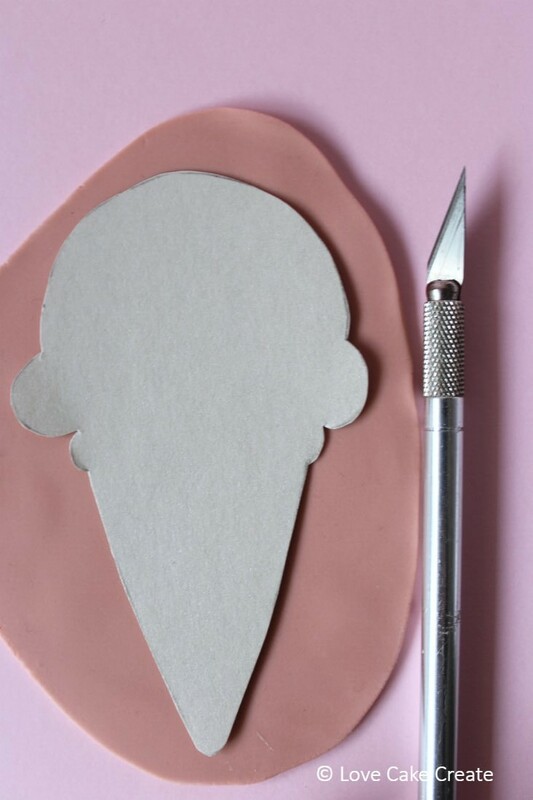 Place the ice cream scoop template on top and use the exacto knife to cut around it. Use your finger to smooth over the cut edges and remove any stray bits. Next, dip the dark brown fondant in the tylose and mix in the powder well. Roll out the dark brown fondant to approximately 2mm thickness (it needs to be the same thickness as the purple scoop). 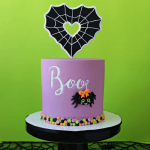 Pop the chocolate drip template on top of the fondant and use the exacto knife to cut it out. Again, use your finger to smooth over the edges. 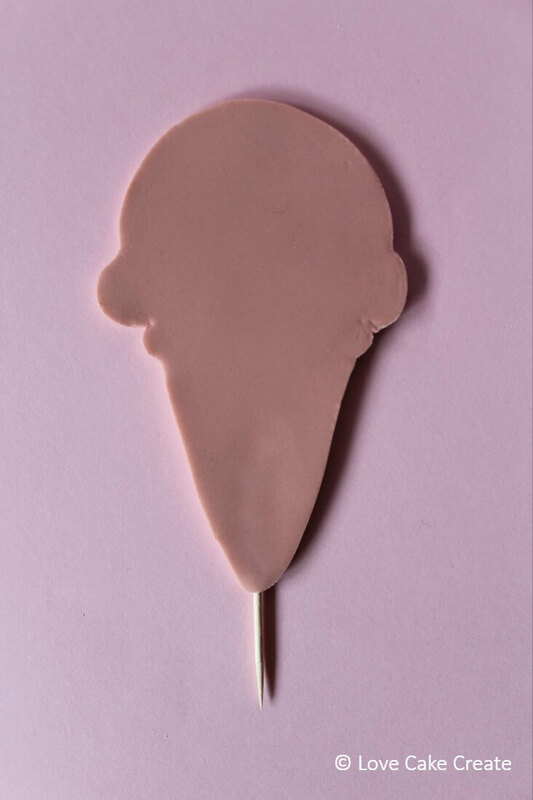 Brush a light layer of sugar glue on the back of the purple ice cream scoop. 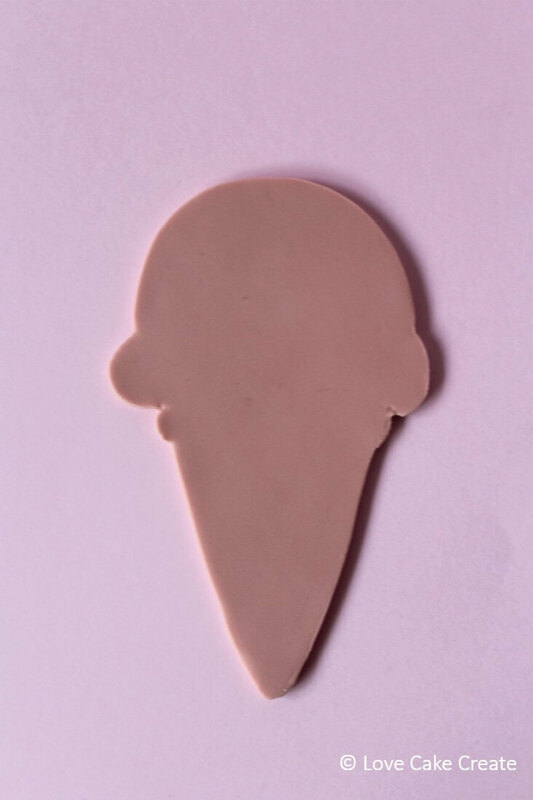 Gently place it in position on top of the light brown ice cream silhouette (as shown below). 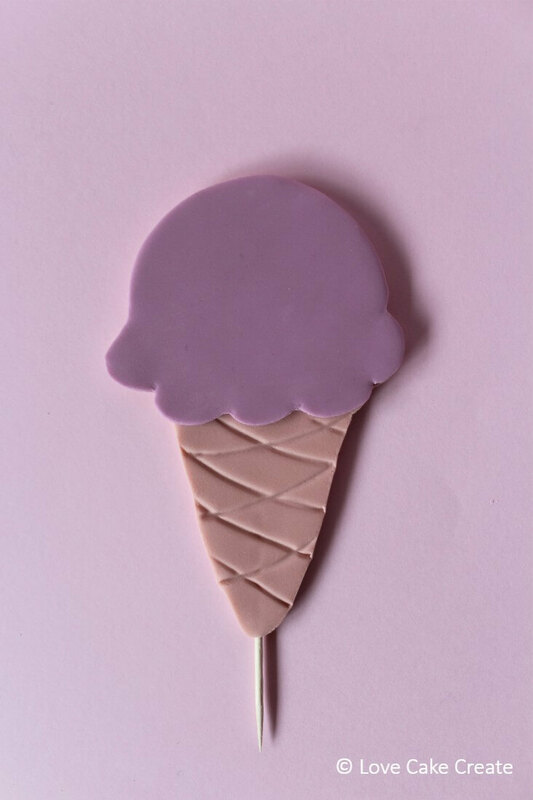 Use your finger to smooth over the fondant to ensure it’s attached properly and encourage the purple fondant right to the edges – we don’t want to see any light brown fondant peeking out from the sides, so keep smoothing until the purple is right at the edges. Remember that this topper will be standing upright so look at it from front-on just to double check. Next, take the chocolate drip and before adding any sugar glue to the back, lay it under the ice cream scoop to make sure it’s a perfect fit. This part is a bit like a puzzle – you want the scoop and drip to fit together seamlessly. 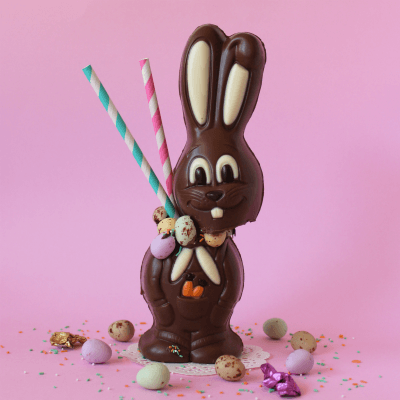 When you’re happy with how they fit, add a tiny bit of sugar glue to the back of the chocolate drip and pop it back in position. Use your finger to smooth over the join and ensure the dark brown fondant goes right to the edges of the cone. To add definition to the ice cream cone, take the flat paintbrush and dip it in the edible brown dust. Remove any excess in a paper/kitchen towel. Add the dust to all the lines you created on the cone. A little goes a long way with this stuff! ** This is the point that I changed my mind with the colour of the ice cream scoop. 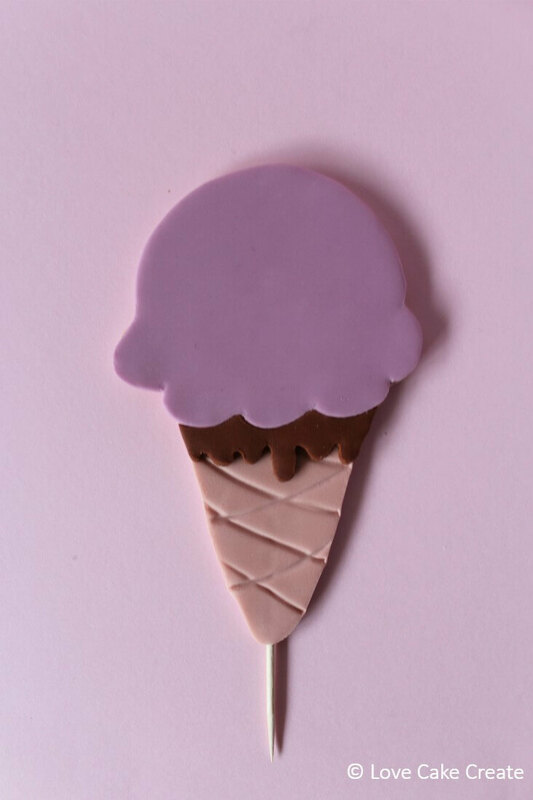 The next few photos will have the ice cream scoop in Wilton Violet. Eyes – Use your template as a guide for how big to make the eyes. Roll two small balls of black fondant and use your finger to flatten them. Pop them on top of the template to ensure they’re the right size. Put them to the side for a minute. Take the white fondant, roll two tiny balls and use your finger to flatten them. Roll another two tiny balls, these ones smaller than the previous two. Add a teeny tiny amount of sugar glue to the back of the white circles and attach them to the black circles as shown below. Mouth – Roll a tiny amount of black fondant into a sausage and curve it into an arc shape. Pop it aside. 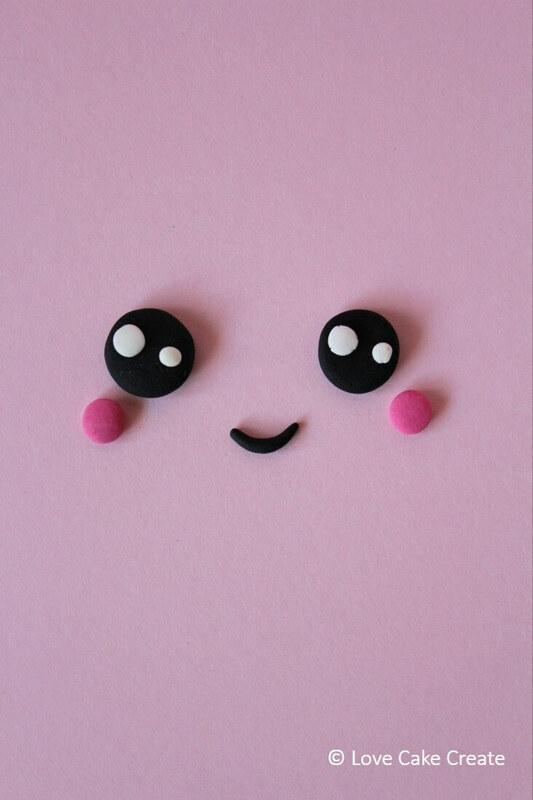 Cheeks – Roll two tiny balls of pink fondant and use your finger to flatten them. Pop them aside. I used the template as a guide for the placement of the eyes, mouth and cheeks. Apply a tiny bit of sugar glue to the back of each piece, secure in place on the fondant and allow to dry. Roll tiny sausages of the pink, purple, yellow, orange, green and blue fondant. Apply a dab of sugar glue to the back of each sprinkle and secure to the top of the ice cream scoop. Allow the whole topper time to dry – after the front has dried, flip it over so the back dries too. Mine only took a day to dry completely. Cover your cake in fondant and add some larger sprinkles to the top of the cake (they were made the same way as the tiny sprinkles on the topper) and secure them to the cake with sugar glue. 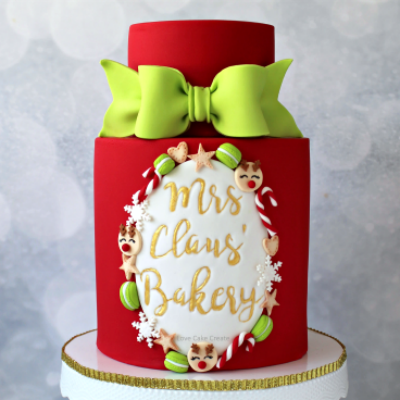 To attach the topper to the cake, add a small amount of sugar glue to the bottom of the topper (or royal icing tinted the same colour as the brown cone will also work) and insert the toothpick directly into the top of the cake. 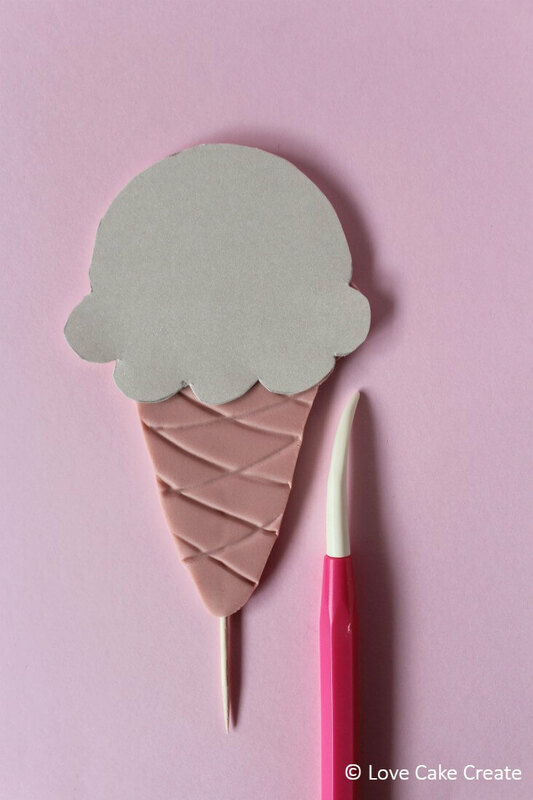 And that’s the end of our adorable ice cream cone cake topper tutorial! I hope you found it helpful and it’s something you’ll use in the future. If you do create this cake topper, I’d love to see! Feel free to tag me on Instagram @love.cake.create or share it on my Facebook page so I can check it out. Have you made a 2D stand up cake topper before? I’d love to hear your feedback or thoughts in the comments below. 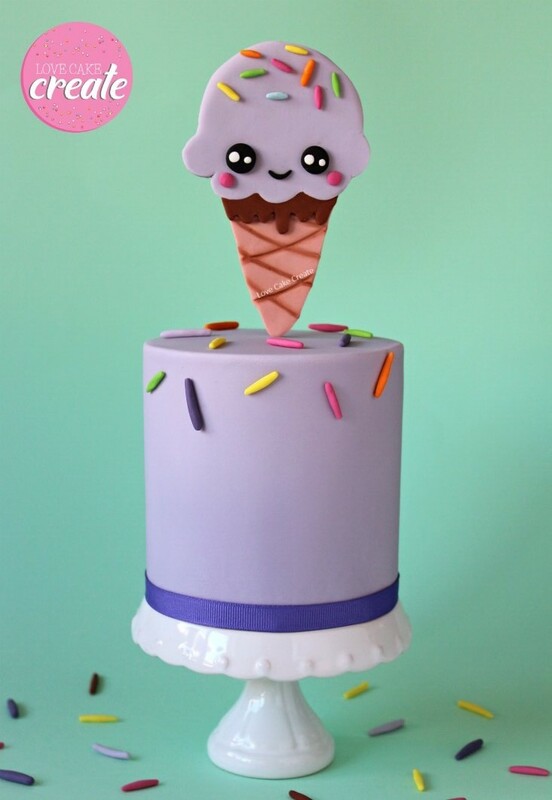 If you enjoyed this ice cream cone cake topper tutorial, don’t forget to PIN it! Thanks Lisa, ice cream and sprinkles are always a favourite with kids! This is so cute and clever. 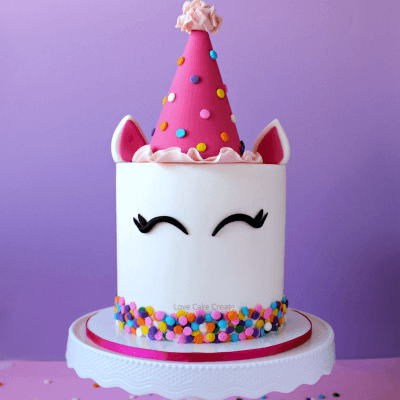 I’ve never worked with fondant before but it looks so fun! Thank you Jenny! Fondant is fun to work with, it’s just like tasty play-doh! That’s so adorable. I wish I had the patience to make it 🙂 You’re so talented! You are so talented! I am sure mine will look like a sadly melting ice cream. 🙂 But I am going to give this a go for a fun summer cake when school is out! Thanks Maddy, I’m sure your creation will work out just fine! It’s actually a really easy topper, much easier than it looks anyway! This is so stinking cute! My favorite part are the sprinkles – but they always are. What a great idea for summer. Thank you Kate, I’m a big fan of sprinkles too! Oh my gosh this is so cute! I love it. It’s perfect for Summer birthdays. So pleased you like it Mihaela! It would be a great addition to a summer party! This is so adorable, and it’s right up my alley for crafting. It’s so cute! I love it. This is so adorable and you made it so easy! I’m totally doing this for my daughter’s first bday this summer!! Yay, I’m thrilled to hear you’re going to give it a go Cammeo! It’s a great cake for a summer birthday party! Thanks Cathy!! Agreed, a funfetti birthday cake would be amazing! This is something my kids would have a blast making! It’s a great project for kids – the young ones will need help cutting out the silhouette with the exacto knife but the decorating part is where the fun is at! Glad you think so Shan, thank you!! You make it look so easy, I love the breakdown of all the steps, looks adorable! That’s awesome Mimi, I hope you have a wonderful birthday on Sunday! Thanks Rachel! It’s a fun cake to make (and eat!). Oh my goodness this is incredible! Wow, I’m so impressed with this cake! This is on my list of cakes to make. Thanks for sharing! Glad you like it Kelly and I’m pleased to hear it’s on your to-make list!! This is so cute!! 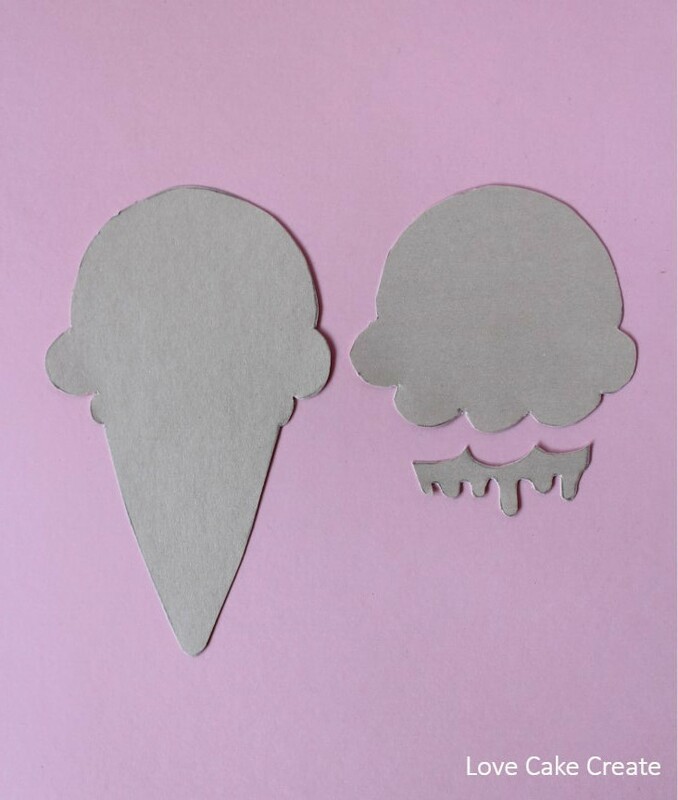 I would have a whole birthday party around these ice cream topper themes!! Thanks Tif! 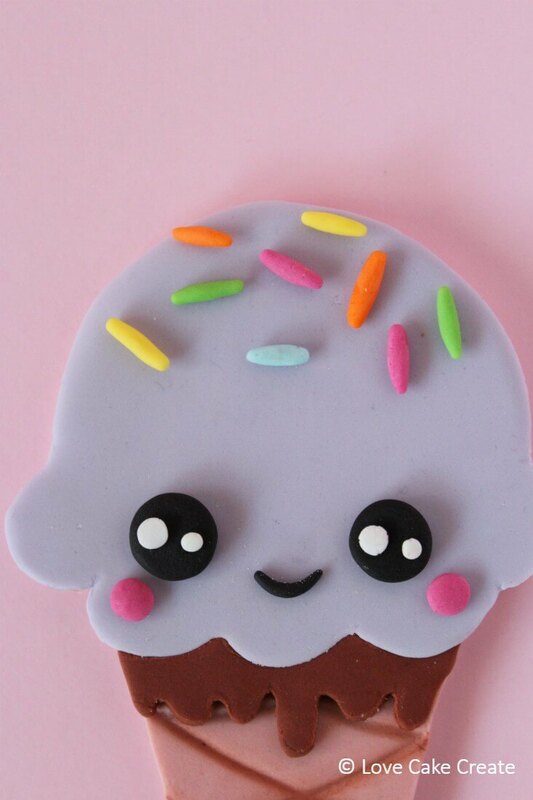 Agreed, an ice cream party is such a fun theme! Thanks so much Holly, I loved creating it!